When Ruddigore opened at the Savoy on January 23th, 1887, it wasn’t in fact ‘Ruddigore’ at all, but ‘Ruddygore’ – the preferred title carefully chosen by both Gilbert and Sullivan together. G&S had a superstition about their operetta titles and never fixed them until just before the opening. Gilbert said in the Pall Mall Budget on January 27th ‘It is not easy to get a good title; I dare say I had half a dozen for this, printing them in block letters to see the effect on the eye. We finally fixed on ‘Ruddygore’. But – it proved to be the most enormous blunder, creating outrage amongst the Savoy audience and critics alike. While Gilbert simply meant ruddy gore, as in red blood, ‘ruddy’ caused huge offence, being a word that would ‘scarcely sound pretty on ladies lips’ (the Graphic). When Gilbert was leaving his club he bumped into a man who asked ‘How is Bloodygore going?’ ‘It isn’t Bloodygore, it’s Ruddygore,’ replied Gilbert. ‘Oh, it’s the same thing’ said the man. 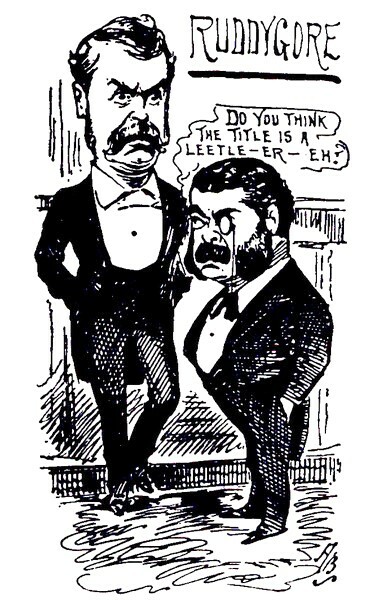 ‘Is it?’ replied Gilbert, never at a loss for a pithy reply, ‘Then I suppose you’ll take it that if I say “I admire your ruddy countenance,” I mean “I like your bloody cheek!” The title ‘Ruddygore’ with its offensive ‘Y’ struggled on for 9 days until Gilbert finally conceded defeat and changed it to the now more familiar ‘Ruddigore’. Perhaps there should be a campaign to bring back the old ruddy title!